Create a photo gallery and publish it on a website with just a couple of mouse clicks: share your photos with your family, create virtual tours for your business, make presentations for your web shop - everything is simple with Easy Website Photo Gallery! This web album generator is very easy to use even for beginners - simply select the photos, choose the gallery template, click the Generate button and let the program do the rest of the work for you. After the gallery is generated you can view it in your browser immediately. Or upload it to a website using a built-in FTP publisher. For professionals, Easy Website Photo Gallery offers complete gallery customization: change the size of the thumbnails, add custom header and footer text to all album pages, use slide show or Lightbox effect, add watermarks to all photos and many, many others. Plus, all gallery templates are pure HTML files. Which means you can easily modify any of them to match the design of a website. But don't just take our word! 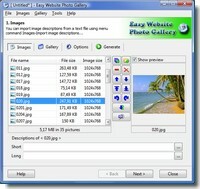 Download and try Easy Website Photo Gallery right now - it's absolutely free for 20 days!